Ranveer Singh and Alia Bhatt croon to energetic tracks from Gully Boy with Vivian Divine at the film's music launch event. 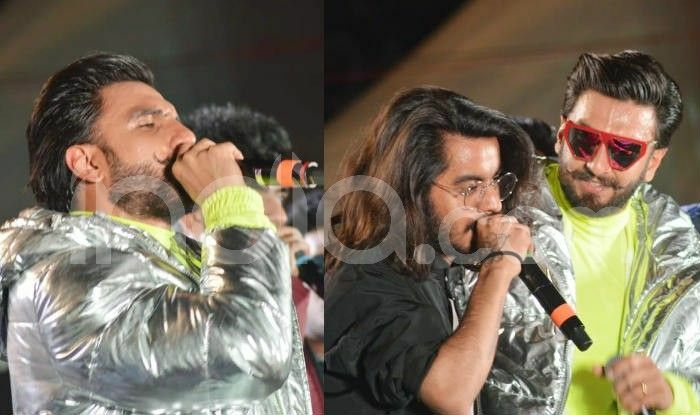 Actors Ranveer Singh and Alia Bhatt launched the music album of their upcoming film Gully Boy with a big music concert in Mumbai. The actors set the stage on fire by singing the songs from their film, directed by Zoya Akhtar. Adding more energy to the concerts were many music artistes including Naezy, Divine, Siddhant, D-Cypher, Dub Sharma, D’Evil, Mc Altaf, Rahul Raahi, Nexus, Spitfire, Ace, Kaam Bhaari, Beatraw, Mc Todfod, Maharya, 1000rBh, Noxious D and Dee MC. The passion with which Ranveer has crooned to Asli Hip Hop and Apna Time Aayega is proof enough that the interest in the field is not new. “I think I was in Class 3 or 4 when I first got into hip-hop. I loved listening to Snoop Dog, Tupac Shakur, The Notorious B.I.G, while growing up and I have been into that kind of music ever since. I used to watch a lot of MTV and that’s where I first experienced it. There is a cousin of mine who migrated to the US and whenever he used to come down for summer holidays, he used to bring this music and we used to sit and hear it all the time,” Ranveer told IANS earlier.